If y'all follow us on Instagram you might have seen the hair fiasco I dealt with last week. A color-run activity gone bad would be an understatement. 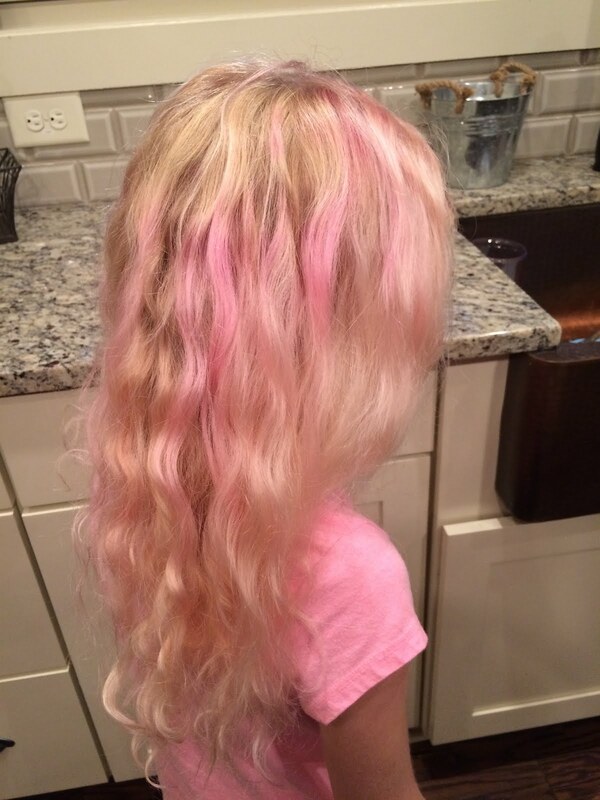 Without going into the details of how and why it happened, all you really need to know is that my sweet little blonde haired baby girl came home looking like this last Monday and I was not happy. I was just hoping this would be one of those times that I would look back and laugh, because at the time I was in tears. While I was frantically researching how to get the color out I came across a few blog posts that gave tips and suggestions. They were helpful and gave me some hope. Most had completed a color run 5K and most had their hair stained from the powder. Some of those people had to have their hair professionally colored to cover up the color run stains and some just dealt with it until it faded. I really hope none of you ever have to deal with something like this, but just in case I wanted to share our experience in case it could help someone else. Because her hair is SO blonde, things that wouldn't be a problem for most other people become a problem for her. If she gets in muddy water at the lake, the red clay can stain her hair and give it an orange tint. Chlorine is a whole other problem for us in the summer. 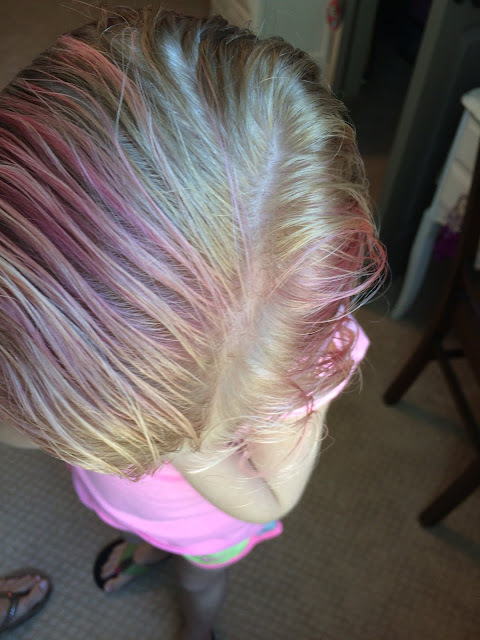 Needless to say, I am no stranger to dealing with her hair color, but never in a million years did I think I'd have to worry about something like this. I sent her right upstairs to the bath as soon as she walked in the door and started rinsing it out. My worst fears were confirmed and the color run powder had stained her hair a deep purple/pink. After the first wash with regular shampoo it still looked as purple/pink as it did when she got off the bus and that's when I started sobbing. I told her it wasn't coming out and she started sobbing, too. She's always told me she wanted straight hair that is dark brown, but as soon as I gave her the news about the state of her hair she immediately started saying she loved her hair and just wanted it to be blonde again. I would like to just note that during this whole time I kept trying to remind myself that it was just hair. I knew deep down that it would be ok. She wasn't hurt, she wasn't sick, and there are a million other horrible things that could have happened to her that would have been so much worse. I tried putting it into perspective, but while I was freaking out about the color of her hair it was just so hard to do and I was so upset. You see, I love her hair. Everyone we run into loves her hair, and it is a defining feature of her looks. Yes, it is just hair, but to me, it is something so special that I treasure and I was so worried it would be ruined for quite some time. 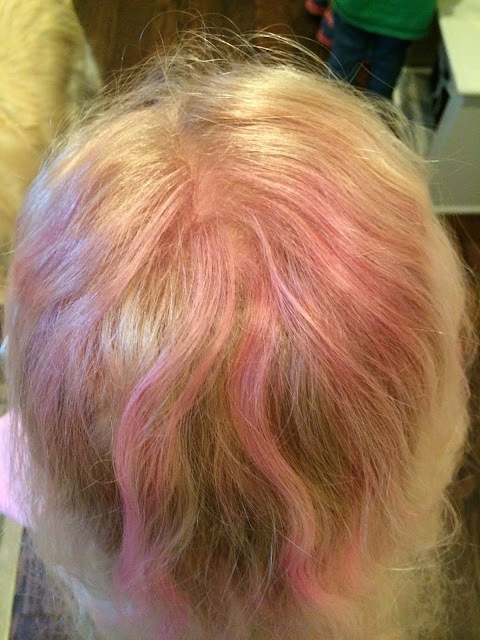 After quickly researching tips and tricks to get the color out and talking with a friend that is also a hairdresser, I began washing her hair with some of the craziest things. 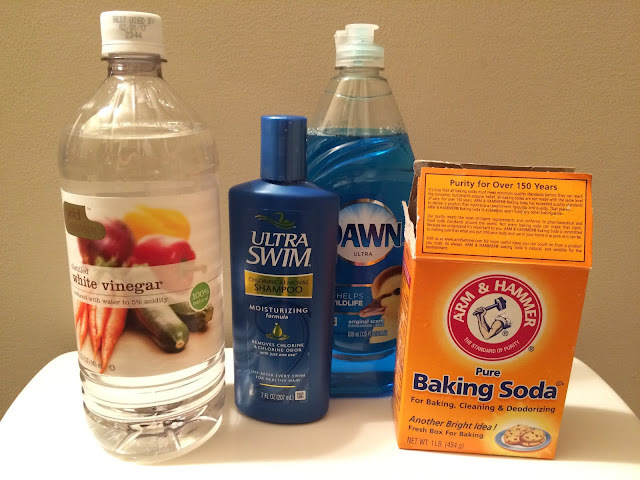 I used a shampoo that was meant for removing/repairing chlorine damaged hair, ketchup, blue Dawn dish soap, laundry detergent, white vinegar and baking soda. Such crazy things, but these were all suggested in some way or another so I was willing to give it a try. I couldn't really tell what was working best and I was in such a panic that I just kept repeating them all over and over again. I only used the vinegar once though because she said it was burning her scalp. As mad and upset as I was about her hair, I didn't want to hurt my girl, so I washed it out as quickly as I got it on her head. I probably washed her hair about 10-15 times total and then it looked like this. We had to go to tumbling and honestly, it was probably best that we had somewhere to go because it forced me to stop washing her hair. I put it in a ponytail wet and off we went. 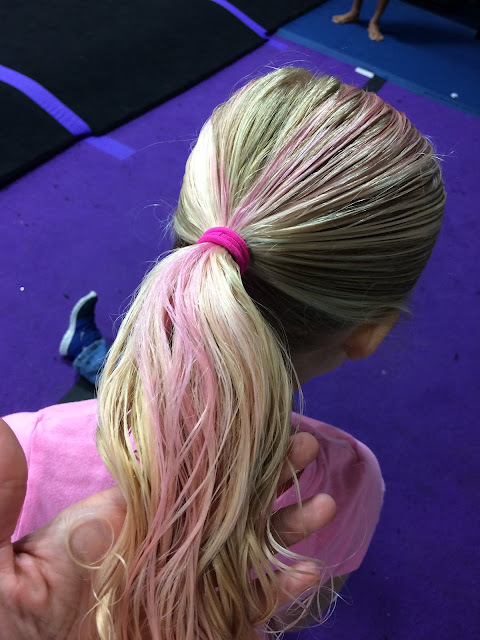 All of her friends at tumbling said they loved her pink hair and I'm not sure at this point what she was thinking. She might have secretly liked the pink highlights, but she knew better than to tell that to me. When we got home that evening it had dried and I could assess what it really looked like. The truth was that it was still really pink. Not bright purple that it had started out as, but it certainly was still very pink. I kept thinking about Frenchie from Grease. I had a lot of people trying to help me feel better about it and saying she looked so trendy with her pink hair, which apparently is really in right now. 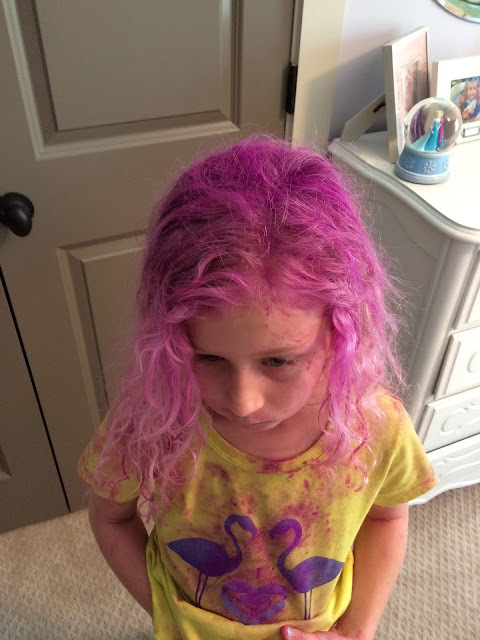 Well the problem is that she is 6, not 26 and there is no way in you-know-what that I would every allow my 6 year old to dye her hair pink. I was so worried that this would be our reality for the near future. From what I had read I thought it would take a month (or more!) to fade and every time I saw her hair I just wanted to cry. Later that night I decided to put her back in the bath and begin the routine of shampooing over and over and over again to see if it would help. This time I just used the Chlorine remover shampoo mixed with baking soda and also a few washes with the Dawn. I washed it about 10 times and then put her to bed with wet hair. 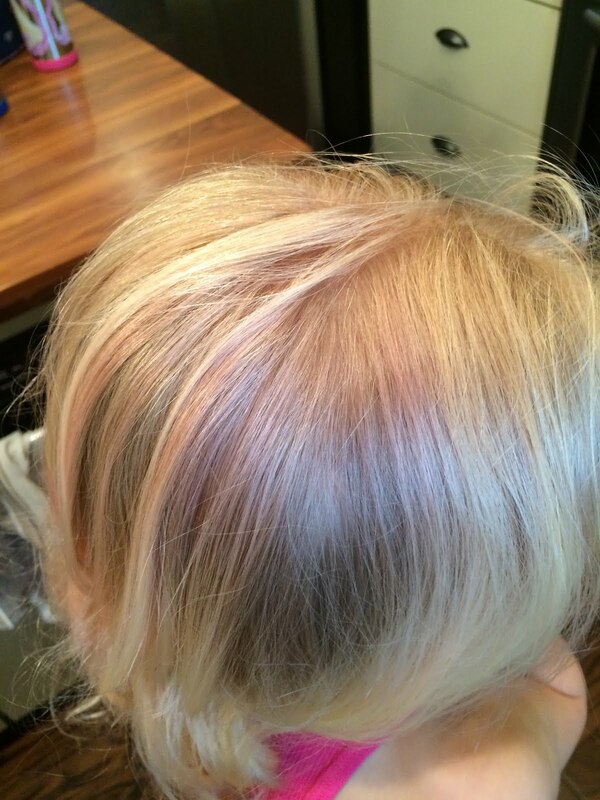 It had a brassy look to it and still what appeared to be a pink tint. The next morning when I woke her up for school I felt her hair and it was like straw. It was so dry and brittle and damaged feeling that it felt like if I brushed it it would literally break right off. Also, it smelled SO bad. I don't know if it was the combination of what I had used or one specific product, but there was no way I could send her to school like that. I knew I had to do something so I began to wash her hair one more time with a shampoo I remembered that I had bought at my salon in the summer when I needed something really good for her hair that had been damaged from the pool. It was Eufora Urgent Repair shampoo. Then I lathered her hair in Eufora leave-in conditioner and had to send her to school with it wet and in a ponytail. Because it was still wet I couldn't really see what it looked like or how much color was still in. When she got home and it was dry I was able to get a good look. Let me just say that I have never been happier. The pink was almost all gone. You can definitely still see it, but it is WAY better than it was and something I can totally deal with until the rest of it fades. Also, the shampoo and leave-in conditioner did WONDERS for the texture of her hair. It was bright and shiny again and I was just so very happy. It has continued to fade over the past week, but it still has pink in it. I think it's just going to continue to fade over time. 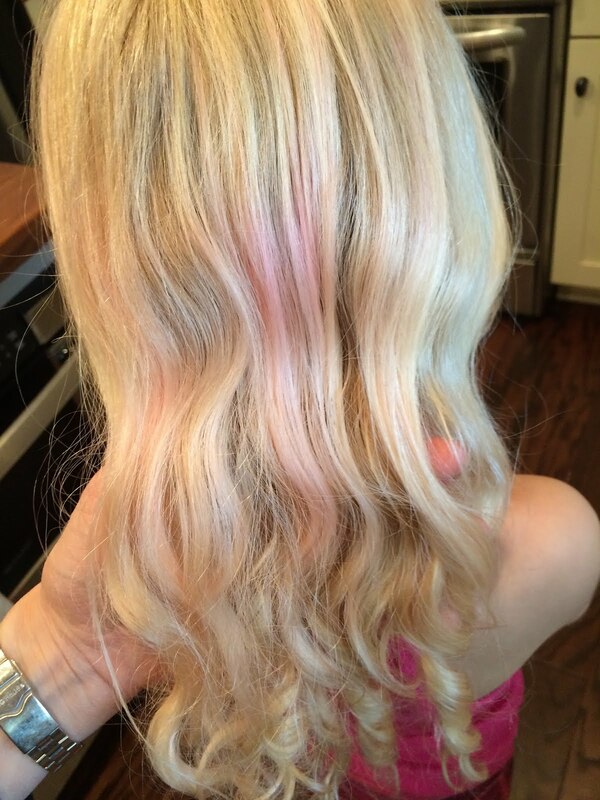 If you end up dealing with color run stained hair this is what I would want to share with you...I knew going into it that a lot of the products I was using on her hair would be very damaging. I knew they would be harsh and dry out her hair, but honestly I didn't care. I cared more about getting the pink out than I did anything else so to me, it was worth it. I am continuing to wash her hair with the repair shampoo and keep using the leave in conditioner which has really helped. Happily, I can kind of laugh about this whole situation now. My mom joked that she must have had the cleanest hair in town and it's probably true. The good thing that came out of this is an even greater appreciation for her hair. Not so much on my part because I always knew I loved it, but for Miss Blondie herself. Of course you always want what you can't have (in her case that is dark, straight hair), but she now realizes just how lucky she is to have such pretty blonde curls. I think her hair looks awesome with the pink streaks. Also the pink will easily fade in a couple weeks. I ran across this post cause im a working professional who works in an office and needs to be formal. Let your 6 year old have all her princess and unicorn dreams come true for a little while, after all it is her hair and like you said, its just hair.